The Prism Library helps architects and developers create composite applications for Windows Presentation Foundation (WPF) using the Model-View-ViewModel pattern. The Prism Library can support those wanting to build a number of application styles with WPF, but it is was primarily constructed for applications composed of discrete, functionally complete pieces that work together to create a single, integrated user interface (UI), often referred to as a composite application. The Prism Library accelerates the development of applications using proven design patterns. Build clients composed of independent, yet cooperating, modules or pieces. Separate the concerns of presentation, presentation logic, and application model through support for presentation model patterns such as Model-View-ViewModel (MVVM). Use an architectural infrastructure to produce a consistent and high quality integrated application. 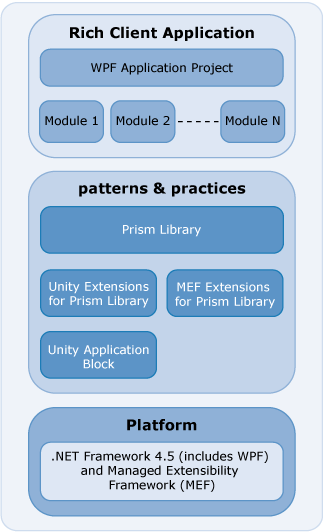 When building your application with the Prism Library, you may use the Unity Extensions for the Prism Library and the Unity Application Block (Unity) or the Managed Extensibility Framework (MEF) Extensions for the Prism Library and MEF. These are built on the .NET Framework 4.5 for WPF, as shown in the following illustration. The Prism Library addresses common requirements for building both composite and non-composite applications on the WPF platform. As a whole, the Prism Library accelerates development by providing the services and components to address these needs. The Prism Library ships signed binaries through NuGet packages to allow you to take advantage of Prism immediately without the need to compile and as source in case you want to make modifications or just see how it works. Add references to the Prism binaries in your code by searching NuGet for Prism. See the list of current Nuget packages. Commanding which includes the DelegateCommand and CompositeCommand..
Interfaces and components to help send loosely coupled messages between modules. The components include the PubSubEvents and EventAggregator. Prism.Wpf. This assembly contains interfaces and components to help build composite applications. These components include the ModuleManager, ModuleCatalog, and Bootstrapper. Additionally, this assembly contains the RegionManager component that helps compose the user interface from multiple parts. It also contains behaviors and actions for interactions with the UI based on Blend for Visual Studio 2013 Behaviors (available in the Blend SDK), largely in support of the MVVM pattern. This includes InteractionRequest, InteractionRequestTrigger, Confirmation, and Notification. Additionally the PopupWindowAction responds to the InteractionRequestTrigger. Prism.Unity. This assembly provides components to use the Unity Application Block (Unity) with the Prism Library. These components include UnityBootstrapper and UnityServiceLocatorAdapter. Prism.Mef. This assembly provides components to use Managed Extensibility Framework (MEF) with the Prism Library. These components include MefBootstrapper and MefServiceLocatorAdapter. Prism.Autofac. This assembly provides components to use the Autofac dependency injection container with the Prism Library. These components include AutofacBootstrapper and AutofacServiceLocatorAdapter. Prism.StructureMap. This assembly provides components to use the StructureMap dependency injection container with the Prism Library. These components include StructureMapBootstrapper and StructureMapServiceLocatorAdapter. Prism.Ninject. This assembly provides components to use the Ninject dependency injection container with the Prism Library. These components include NinjectBootstrapper and NinjectServiceLocatorAdapter. The source for Prism, Prism.Wpf, Prism.Unity, Prism.Mef, Prism.Autofac, Prism.StructureMap, and Prism.Ninject assemblies can be found in the PrismLibrary folder where the Prism repo has been forked. These assemblies target WPF applications. If you want to modify the Prism Library, you can replace the NuGet referenced assemblies with your own version of the binaries. If you modify the Prism Library and want to verify that existing functionality is not broken, execute the unit tests for the projects. To run all the desktop unit tests in the solution file PrismLibrary.sln, on the Test menu, point to Run, and then click All Tests in Solution. "Unity Application Block" on MSDN: http://www.msdn.com/unity. Unity community site on CodePlex: http://www.codeplex.com/unity. "Managed Extensibility Framework Overview" on MSDN. MEF community site on CodePlex: http://mef.codeplex.com/. For more information about service locator, see the Common Service Locator on CodePlex: http://commonservicelocator.codeplex.com/.